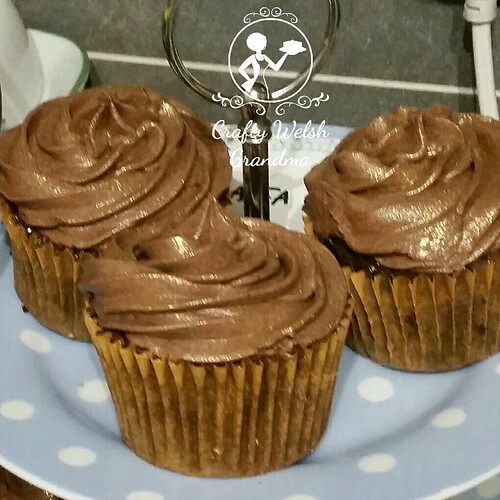 Otherwise known as Chocolate Orange cupcakes. I wasn't sure how these would go down with the guests, so I didn't make many - big mistake! I used the chocolate mix from my recipe book and did not add any orange extract to this portion of the cupcake. For the buttercream, however, I used the chocolate recipe and added some orange extract. Before I added the buttercream, I scooped out about a tea spoon's worth of sponge from the centre of the cupcake. To this 'hole' in added orange jelly aka jello (suitable for vegetarians). Then, rather carefully, I started adding the buttercream until the hole was covered then carried on until I finished the cupcake. What ever else could I top this off with other than gold lustre dust! Perfection on a plate!